From test pits to septic system design and installation, let Rowell’s handle the job from start to finish. With a septic system designer providing you with the most efficient septic design, trust our experienced installers to build and install your next system. NOW OFFERING FINANCE OPTIONS! Get pre-qualified same day! 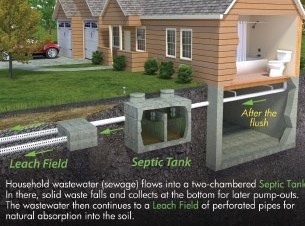 The Mechanics of a Septic System: Water flows out into the septic tank and then drains out into the leach field area.